The lemon balm or lemon balm is an aromatic perennial plant that can reach 80 cm. High. In the spring shoots check, renewed every year. The stems are straight, angular, hairy, simple and covered by a shallow groove. The leaves are arranged against one another, coupled, large and with some hairs on the surface. The flowers are borne at the top, along with a few branches off the top of the stem, often spring up in groups of three, forming a rodajuela around the stem. The whole plant has a pleasant aroma reminiscent of lemon and taste of the leaves and flowering tops is not unpleasant to the taste, and scent predominates the taste. Flowers in spring and summer, from May onwards. Has an advantage over other species is that, wherever it is planted, it is sufficient for the plant is not lost from one year to another. It is therefore not difficult to see in gardens, slopes, streams, etc., often remnants of previous crops. Interesting collection of leaves and flowering tops. It is collected when you are about to bloom and dries quickly. People living in the field can easily grow lemon balm, even in pots. The first bushes can be planted from cuttings, dividing the stock into portions. Melissa found in an essential oil rich in aldehydes, alcohols and terpenes. It also contains tannins, phenolic acids and a bitter principle. Finally, in its composition are mucilage and flavonoids. 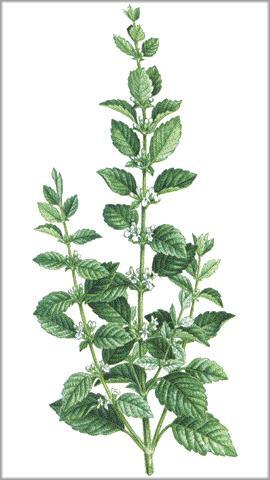 Lemon balm is a great tonic, stimulant and antispasmodic. It is used to revive the unconsciousness and soothe the nerves, heart, and all bodies overstimulated. It is also an excellent digestive, carminative, antiseptic and healing. The balm is a plant that become part of the composition of the "water of Carmen", so called because the Carmelite friars made. The recipe has been preparing Carmen water for over 400 years and is the most popular antispasmodic, marketed today and very popularly used for combat any state of anxiety or agitation indigestion, fainting, nervous breakdowns, and so on. Infusion. Infusion is prepared from a dessert spoon per cup, taking no more than 3 cups a day. Water. The water known Carmen-marketed with the same name is taken diluted, usually in a glass of lime, because it is very strong. You can also add a few drops or a sugar cube. Fresh plant juice. Applied directly to the skin to alleviate the symptoms of insect bites. Infusion external use. In the form of hot baths, and relaxing. In the pharmaceutical market can be found in tablets balm, chopped plant, plant extract, dye, etc.. As well as many presentations as part of composite. Digestive Strong, Moderate sedation, Light Balsamic. Important: The use of information on medicinal plants, without the minimum knowledge in dosage and descriptions can cause problems or side effects. You should always talk to a doctor, pharmacist or qualified personnel before taking herbs or medicinal plants. Take the texts and information such as single orientation for subsequent verification contrast and medical professionals. World Topic assumes no liability in connection with the material on the web.